It's summer time so throw on your flip flops and enjoy! Fun in the Sun is fast and easy to make. The pieced blocks are just right for using up all those colorful scraps we all have. 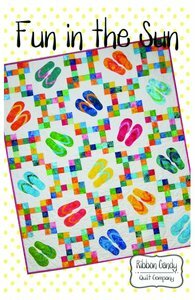 The flip flops are appliqued using the fusible web method. The quilt finishes at 60" x 72".